The security agencies and police began the year braced for at least some opposition, rehearsing arguments for the debate. In the end, faced with public apathy and an opposition in disarray, the government did not have to make a single substantial concession to the privacy lobby. Snowden in 2013 revealed the scale of mass surveillance – or bulk data collection as the security agencies prefer to describe it – by the US National Security Agency and the UK’s GCHQ, which work in tandem. But, against a backdrop of fears of Islamist attacks, the privacy lobby has failed to make much headway. Even in Germany, with East Germany’s history of mass surveillance by the Stasi and where Snowden’s revelations produced the most outcry, the Bundestag recently passed legislation giving the intelligence agencies more surveillance powers. The US passed a modest bill last year curtailing bulk phone data collection but the victory of Donald Trump in the US presidential election is potentially a major reverse for privacy advocates. On the campaign trail, Trump made comments that implied he would like to use the powers of the surveillance agencies against political opponents. The Liberal Democrat peer Lord Strasburger, one of the leading voices against the investigatory powers bill, said: “We do have to worry about a UK Donald Trump. If we do end up with one, and that is not impossible, we have created the tools for repression. If Labour had backed us up, we could have made the bill better. We have ended up with a bad bill because they were all over the place. The Investigatory Powers Act legalises powers that the security agencies and police had been using for years without making this clear to either the public or parliament. In October, the investigatory powers tribunal, the only court that hears complaints against MI6, MI5 and GCHQ, ruled that they had been unlawfully collecting massive volumes of confidential personal data without proper oversight for 17 years. 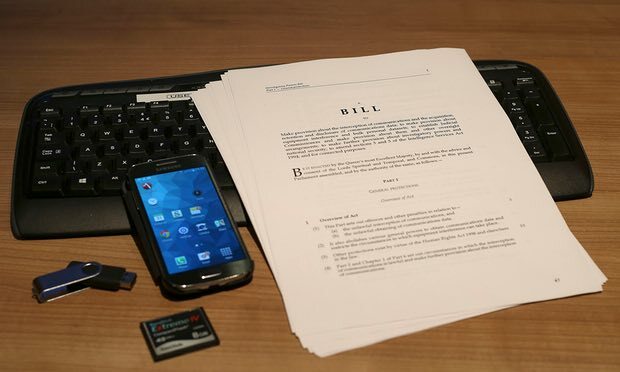 One of the negative aspects of the legislation is that it fails to provide adequate protection for journalists’ sources, which could discourage whistleblowing. One of the few positives in the legislation is that it sets out clearly for the first time the surveillance powers available to the intelligence services and the police. It legalises hacking by the security agencies into computers and mobile phones and allows them access to masses of stored personal data, even if the person under scrutiny is not suspected of any wrongdoing. Privacy groups are challenging the surveillance powers in the European court of human rights and elsewhere. Trump’s victory started speculation that, given his warm words for Vladimir Putin, he might do a deal with the Russian president to have Snowden sent back to the US where he faces a long jail sentence. Snowden has lived in Russia since leaking tens of thousands of documents to journalists in 2013. But Bill Binney, a former member of the NSA who became a whistleblower, expressed scepticism: “I am not sure if the relationship a President Trump would have with President Putin would be bad for Snowden. This article was amended on 19 November 2016. The act has not yet received royal assent, as stated in an earlier version.